As fall starts to become more apparent from the nostalgic smell in the air, and the rapid descent of the leaves falling from trees, the torch begins the last few legs of its journey. 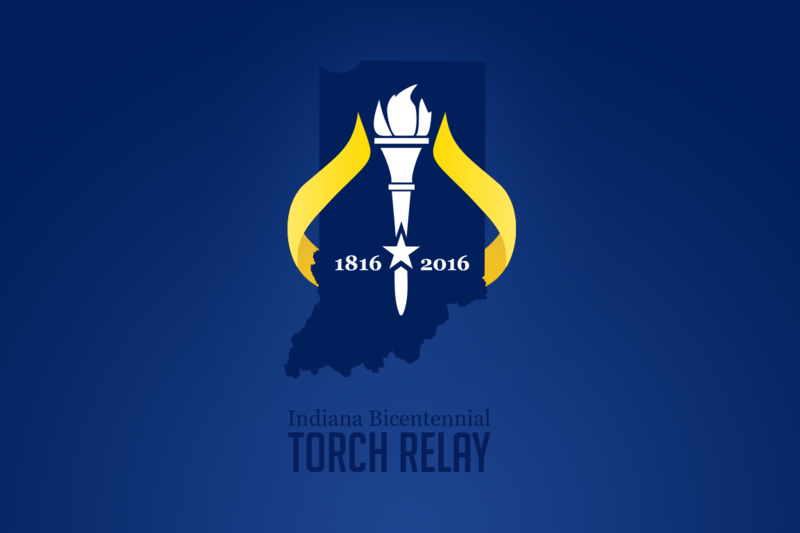 On October 2, the torch passed through Steuben County from approximately 12:00 PM – 2:30 PM. Though most people are starting to prepare for Halloween, and other fall related activities, I personally cannot help but think about snowcapped landscapes. That is because within Steuben County lives the city of Angola, which is where you can visit Potawatomi Inn in Pokagon State Park. During the colder months of the year, this location becomes a breathtaking winter wonderland. The land for Potawatomi Inn was purchased in 1925 by the residents of Steuben County and was offered as a Christmas gift to the State of Indiana (1). This acquisition included over 580 acres of land near the shores of Lake James and Snow Lake in northern Indiana. Construction for the inn began in 1926, and was completed roughly two years later (1). Amenities currently found within the inn include pontoon, small paddle boats, and bicycle rentals, an indoor swimming pool, a library, and more. I remember when I visited the inn back in 2008, I was most taken by the Staffed Activity Room. It was in this room where my family and I were able to decorate pre-made wooden crafts. I remember I painted an apple intended for one of my favorite teachers. I also decorated a wooden plaque with my name using markers. I remember thinking that these wooden crafts were so cool to decorate, because I had never been to an inn before (or since) that had such a unique activities room. I also remember the large, open space behind the inn. 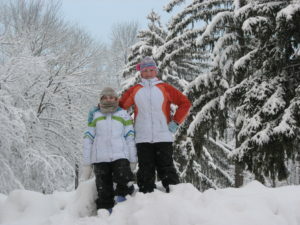 There, my family and I were able to play in the abundance of snow that had fallen that year. Potawatomi Inn, especially in the winter, stands out as one of most unique lodging experiences in the state. The history surrounding Pokagon State Park is quite fascinating. The name “Pokagon” supposedly derives from the name of an American Indian who was abducted from his Chippewa village by the Potawatomi in the late 1700s (1). This American Indian was given the name “Pokagon” by the chief of the village because he was wearing a headdress that contained a human rib, and the word for “rib” is “Pokagon” in the Potawatomi language (1). The name of the state park was not officially named “Pokagon” until 1927 (1). Between 1934 and 1942, the Civilian Conservation Corps, or CCC, constructed most of the buildings and structures found at Pokagon State Park and Potawatomi Inn. The CCC was one of the first programs created under President Franklin D. Roosevelt’s New Deal. The goal of the CCC was to provide work for the rural unemployed, promote environmental conservation, and to “build good citizens through vigorous, disciplined labor” (2). Controlled by the army, the CCC had an enrollment of approximately 500,000 workers by 1935, and these workers were responsible for over half of the public and private reforestation efforts completed in the nation’s history (2). The CCC also constructed 3,470 fire towers and 97,000 miles of fire roads, and was able to plant over three billion trees across the United States (3). Another memorable accomplishment of the CCC was drainage and working tirelessly during emergency floods. In 1937, the CCC saved lives and prevented the destruction of a great deal of property when the Ohio River began flooding in southern Indiana (3). Kurtz Camp 1594 near Kurtz, Indiana, also known as “Camp Little America,” was one of the most notable CCC camps in Indiana (4). Other notable camps include the Bryantsville 1586 in Spice County Township in Lawrence County, the English Camp 2593 near Paoli, and Tell City Camp 1597/2583 near Tell City (5). Overall, these camps helped foster a culture where Americans began to sincerely care about conservation efforts, and how to efficiently use natural resources. Virgil Simmons, the commissioner for the Indiana Department of Conservation during this period of time, was quoted saying, “the progress of Indiana’s conservation program has been demonstrated in recent weeks with increased membership in conservation clubs, increased activity on the part of the clubs, and increased interest in the state’s natural resources” (6). One specific structure built by the CCC, and probably one of the most iconic structures found at Pokagon State Park, is the Toboggan Run. 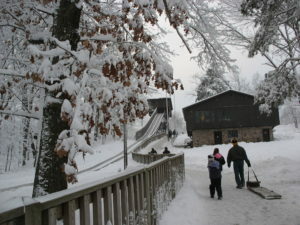 It is Indiana’s only refrigerated Toboggan run, and stands over 30 feet tall, creating a vertical drop that spans more than 90 feet over the course of a square mile (7). My family and I lugged our huge sled all the way up the stairs the top of the slide. The sled was incredibly heavy, and the 30-second trip down the slide almost – but just almost – was not worth the labor. Regardless, it was still a fun and memorable experience. Another activity that we participated in at the park was cross-country skiing. Different than downhill skiing, cross-country skiing feels like you are gliding over ice, as if your bones were also made out of light, new-fallen snow. In warmer weather, there are plenty of other activities for tourists to take part in, such as hiking and biking along trails, and fishing at the nearby lakes. The torch made an appearance at the Trine State Recreation Area Welcome Center Parking Lot while making its way through Pokagon State Park. After 2:00 PM, a closing ceremony in honor of the bicentennial began on the Potawatomi Inn Lawn accompanied by cupcakes and entertainment (8). Plan your visit to Pokagon State Park today, and see what other events are taking place throughout the fall by clicking here. Start planning a trip this winter to enjoy the scenic, cozy benefits that come with lodging in Potawatomi Inn by clicking here.